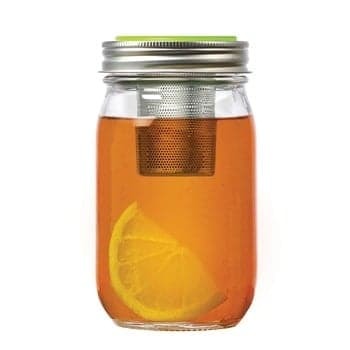 This tea infuser lid for regular mouth Mason jars makes it so easy to brew tea in your favorite jar! We are in love with this tea infuser that allows you to brew/steep your tea directly in your favorite jar and, as a bonus, makes it so easy to steep your tea on the go! When you’re ready to drink your tea, remove the lid and enjoy! You can also use this lid to add fruit or other infusions to your beverages.